Personal Lea: The First Contest in our New Shop! The First Contest in our New Shop! You KNOW how we love contests, and today we received the great news that one of our vendors, Princess Linens, drew our name in THEIR contest! What did we win? 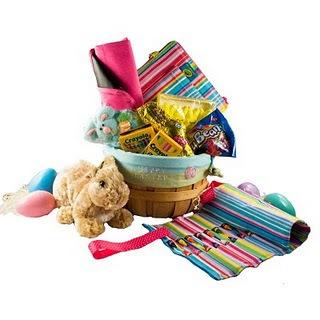 Well, a fabulous Princess Linens Easter Basket! and what are we going to do with this fab basket? Give it away to one of our loyal customers, of course! Stuffed with a Doodlebugz Doodlebag, a Doodlebugz Chalk Talk Chalkboard Placemat, a Doodlebugz Crayon Keeper, a cuddly bunny and plenty of candy to keep your budding artist's creativity soaring! What we're excited about this week!